← Chicken & Waffles B.L.A.T. Every year, we celebrate this day dedicated to doughnuts! Remember celebrating with me last year with vegan baked donuts? This time, I’m at my parent’s house for a week and I think we are avoiding fried food, so this year is another baked version. 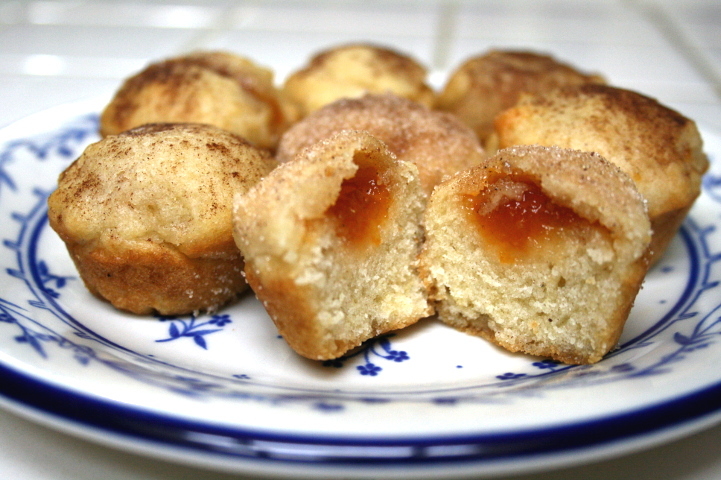 I don’t have my donut pans here so we had mini donut muffins filled with apricot jam! They’re like those little donut holes! 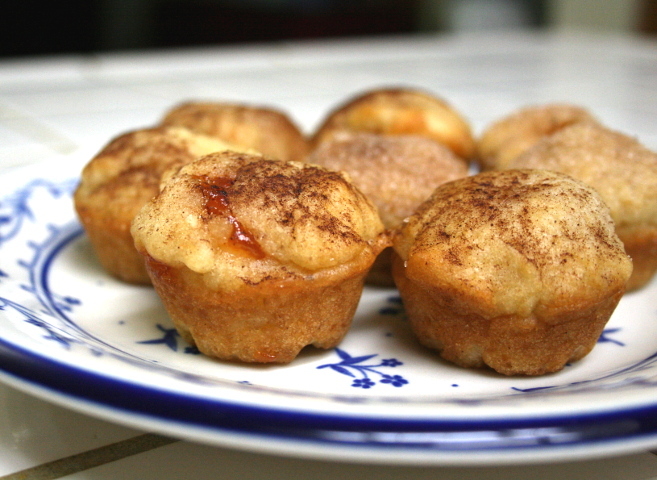 I first made donut muffins years ago, back in 2007. Wow, has it been that long already?! I pretty much followed Bake and Destroy’s recipe, (click over there for the detailed steps and the recipe), except that I used one 24-well mini-muffin tin and filled them with jam. 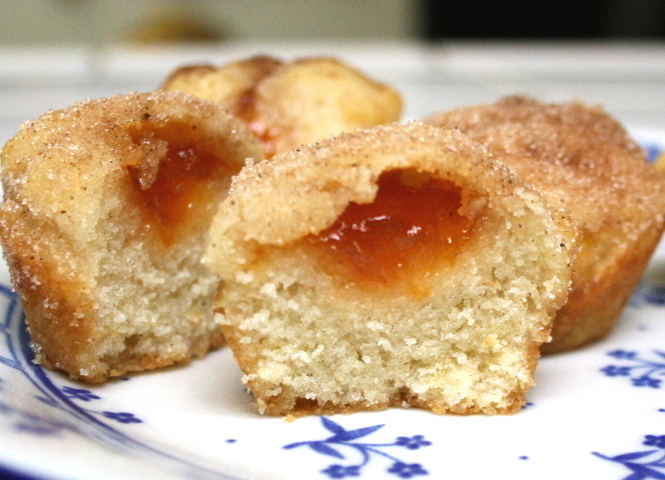 After spritzing the pan with a light coating of spray oil, I added about 2 teaspoons of doughnut batter, then a teaspoon of apricot jam on top. Then another teaspoon and a half of batter to cover the jam. Try any filling you can think of! I also reduced the sugar quite a bit and used only 3 tablespoons (evaporated cane sugar or coconut palm sugar are my preferences) instead of the 1/2 cup in the original recipe. I think maybe even 2 tablespoons could work. 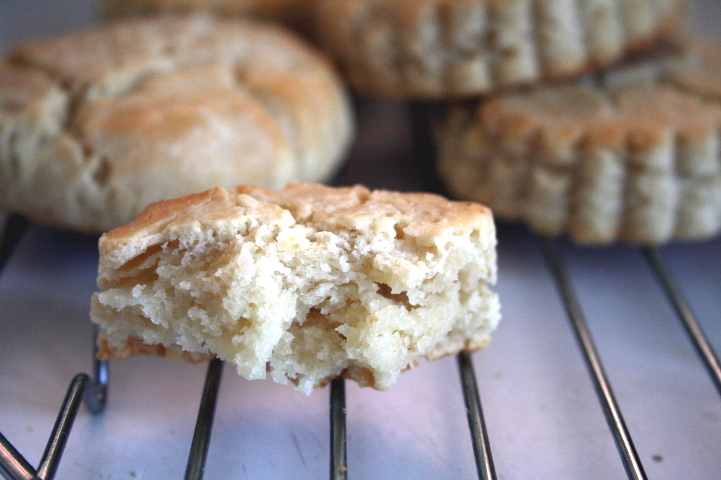 These minis (2 dozen of them) bake for about 12-15 minutes (instead of the 20 min. for the regular-sized muffins) at 350 degrees F. After baking, they get brushed with some melted butter (or maybe melted coconut oil if you prefer) and then sprinkled with cinnamon sugar. 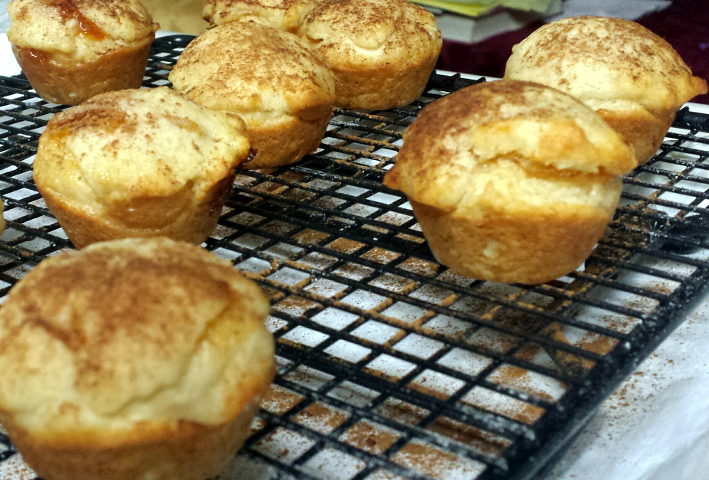 I liked them plain with just a dusting of cinnamon. I love cinnamon! Even though these aren’t exactly doughnuts and they aren’t fried, it has all the goodness (yumminess) of it! As Natalie Slater, the blogger behind Bake and Destroy says, “donut muffins are f***n’ awesome!” Try these for yourselves! Thank you for the Doughnuts! D-Day & Doughnut Day Anniversaries Today! This entry was posted in Baking, Breakfast, Food, Holidays, Recipes, Snacks and tagged bake & destroy, baked, donut muffin, Doughnut, filled doughnut, Muffin, National Doughnut Day. Bookmark the permalink. I have never heard of this special day before. How crazy is that? I want a no added sugar, gluten free ice-cream day. That sounds like it would be a fun day! Yep. A sweet sticky day. amazing 🙂 Thanks for helping me celebrate belatedly!